Brown fat surrounds the lymphatic system. 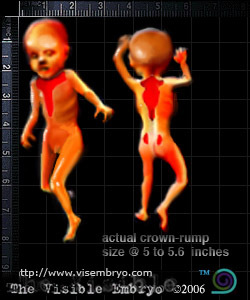 LENGTH: The crown-to-rump length is about 5 to 5.6 inches (12.5 to 14cm). WEIGHT: About 5.25 ounces (150g). MOTHER"S SIZE: Uterus can be felt just below the bellybutton. Placing your fingers sideways, it is about two finger-widths (1 inch) below your bellybutton. The uterus is the size of a small mellon. Total weight gain to this point should be 10 to 13 pounds (4.5 to 5.8g). However, this can vary widely. Fetus has phases of sleep and waking and may prefer a favorite sleep position. Temporary hair called lanugo appears on the head. Lanugo may fall out in the second week after birth, allowing fine scalp hair to grow. Eyebrows begin to form. Ovaries of female fetuses contain primitive egg cells. The uterus of female fetuses is also fully formed. Brown fat (colored by capillary growth) coats neck, chest and crotch areas around the lymphatic system. The vernix (consisting of dead skin, lanugo cells, and oil from glands) is now clearly formed and visible covering the skin. 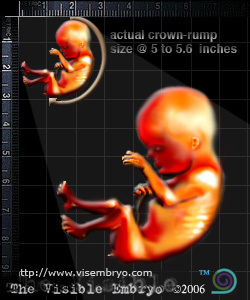 Placenta is fully formed and grows in diameter though not in thickness.